The In-Memory Column Store (IM column store) stores tables and partitions in memory using a columnar format optimized for rapid scans. 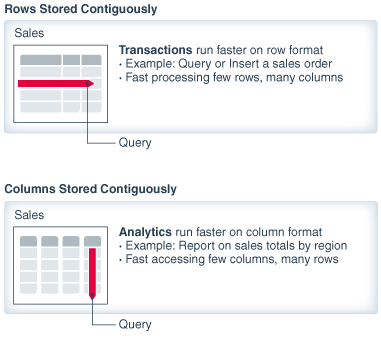 Oracle Database uses a sophisticated architecture to manage data in columnar and row formats simultaneously. When you enable an IM column store, the SGA manages data in separate locations: the In-Memory Area and the database buffer cache. The IM column store manages both data and metadata in optimized storage units, not in traditional Oracle data blocks. The Expression Statistics Store (ESS) is a repository maintained by the optimizer to store statistics about expression evaluation. The ESS resides in the SGA and persists on disk. In response to queries and DML, server processes scan columnar data and update SMU metadata. Background processes populate row data from disk into the IM column store. For data that does need to be scanned in the IM column store, the database uses SIMD (single instruction, multiple data) vector processing. The IM column store encodes data in a columnar format: each column is a separate structure. The columns are stored contiguously, which optimizes them for analytic queries. The database buffer cache can modify objects that are also populated in the IM column store. However, the buffer cache stores data in the traditional row format. Data blocks store the rows contiguously, optimizing them for transactions. The following figure illustrates the difference between row-based storage and columnar storage. Description of "Figure 2-1 Columnar and Row-Based Storage"
The In-Memory Area is an optional SGA component that contains the IM column store. The database buffer cache stores and processes data blocks in the same way whether the IM column store is enabled or disabled. Buffer I/O and buffer pools function the same. The In-Memory Area is controlled by the INMEMORY_SIZE initialization parameter. By default, the size of the In-Memory Area is 0, which means the IM column store is disabled. 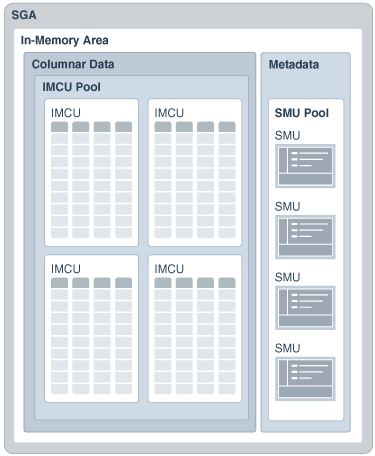 The In-Memory Area is divided into subpools for columnar data and metadata. To enable the IM column store, set the In-Memory Area to at least 100 MB. The size is shown in V$SGA. The In-Memory Area is subtracted from the SGA_TARGET initialization parameter setting. For example, if you set SGA_TARGET to 10 GB, and if you set the INMEMORY_SIZE to 4 GB, then 40% of the SGA_TARGET setting is allocated to the In-Memory Area. The following graphic illustrates the relationship. Description of "Figure 2-2 INMEMORY_SIZE and SGA_TARGET"
Unlike the other components of the SGA, including the buffer cache and the shared pool, the In-Memory Area size is not controlled by automatic memory management. The database does not automatically shrink the In-Memory Area when the buffer cache or shared pool requires more memory, or increase the In-Memory Area when it runs out of space. Free memory is available in the SGA. The new size for INMEMORY_SIZE is at least 128 MB greater than the current setting. You cannot use ALTER SYSTEM to reduce INMEMORY_SIZE. The V$INMEMORY_AREA and V$SGA views immediately reflect the change. "Increasing the Size of the IM Column Store Dynamically"
This subpool stores the IMCUs, which contain the columnar data. The V$INMEMORY_AREA.POOL column identifies this subpool as 1MB POOL, as shown in Example 2-1. This subpool stores metadata about the objects that reside in the IM column store. The V$INMEMORY_AREA.POOL column identifies this subpool as 64KB POOL, as shown in Example 2-1. Description of "Figure 2-3 Subpools in the In-Memory Area"
The database determines the relative size of the two subpools using internal heuristics. The database allocates the majority of space in the In-Memory Area to the columnar data pool (1 MB pool). Oracle Database automatically determines the subpool sizes. You cannot change the space allocations. In this example, the memory allocated to the subpools is 9.97 GB, whereas the size of the In-Memory Area is 10 GB. The database uses a small percentage of memory for internal management structures. The IM column store enables data to be simultaneously populated in the SGA in both the traditional row format (the buffer cache) and the columnar format. The database transparently sends OLTP queries (such as primary key lookups) to the buffer cache, and analytic and reporting queries to the IM column store. When fetching data, Oracle Database can also read data from both memory areas within the same query. In the execution plan, the operation TABLE ACCESS IN MEMORY FULL indicates that some or all data is accessed in the IM column store. The dual-format architecture does not double memory requirements. The buffer cache is optimized to run with a much smaller size than the size of the database. The following figure shows a sample IM column store. The database stores the sh.sales table on disk in traditional row format. The SGA stores the data in columnar format in the IM column store, and in row format in the database buffer cache. 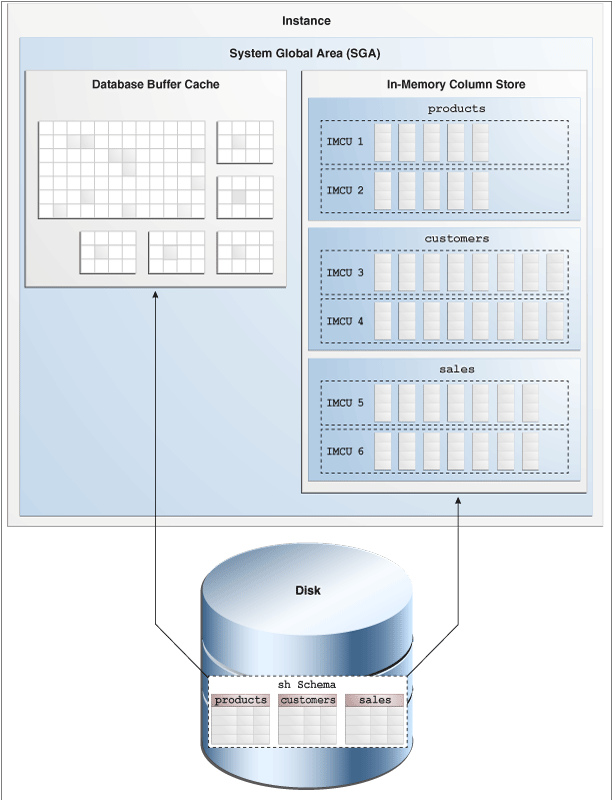 Description of "Figure 2-4 IM Column Store"
Every on-disk data format for permanent, heap-organized tables is supported by the IM column store. The columnar format does not affect the format of data stored in data files or in the buffer cache, nor does it affect undo data and online redo logging. The database processes DML modifications in the same way, regardless of whether the IM column store is enabled, by updating the buffer cache, online redo log, and undo tablespace. However, the database uses an internal mechanism to track changes and ensure that the IM column store is consistent with the rest of the database. For example, if the sales table is populated in the IM column store, and if an application updates a row in sales, then the database automatically keeps the copy of the sales table in the IM column store transactionally consistent. A query that accesses the IM column store always returns the same results for a query that accesses the buffer cache. Oracle Database maintains the storage units in the In-Memory Area. The following graphic gives an overview of the In-Memory Area and the database processes that interact with it. The remaining chapter describes the various memory components. Description of "Figure 2-5 IM Column Store: Memory and Process Architecture"
An In-Memory Compression Unit (IMCU) is a compressed, read-only storage unit that contains data for one or more columns. A Snapshot Metadata Unit (SMU) contains metadata and transactional information for an associated IMCU. 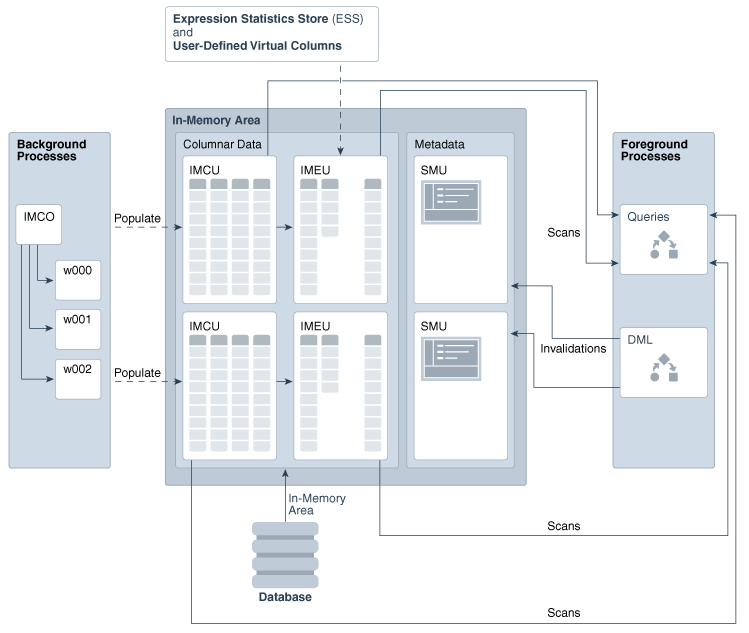 An In-Memory Expression Unit (IMEU) is a storage container for materialized In-Memory Expressions (IM expressions) and user-defined virtual columns. An IMCU is analogous to a tablespace extent. An IMCU has two parts: a set of Column Compression Units (CUs), and a header that contains metadata such as the IM storage index. The IM column store stores data for a single object (table, partition, materialized view) in a set of IMCUs. 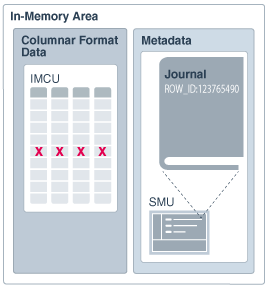 An IMCU stores columnar data for one and only one object. A Column Compression Unit (CU) is contiguous storage for a single column in an IMCU. Every IMCU has one or more CUs. Every IMCU header automatically creates and manages In-Memory Storage Indexes (IM storage indexes) for its CUs. An IM storage index stores the minimum and maximum for all columns within the IMCU. 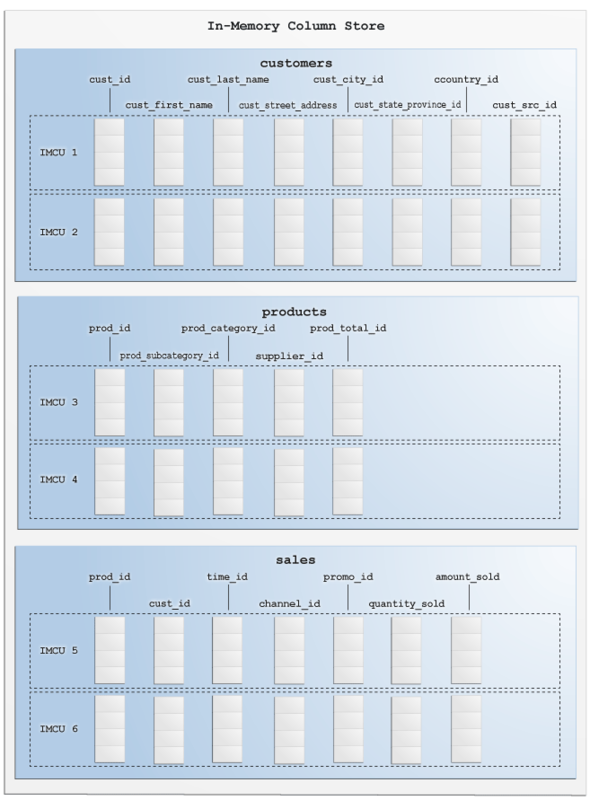 The following graphic represents three tables from the sh schema populated in the IM column store: customers, products, and sales. In this example, each table has a different number of columns specified INMEMORY. The IMCUs for each table include only data for the specified columns. 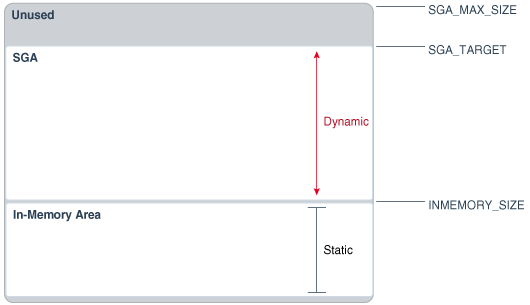 Description of "Figure 2-6 Columns and IMCUs"
The IM column store uses special compression formats optimized for access speed rather than storage reduction. The columnar format enables queries to execute directly against the compressed columns. Each IMCU contains all column values (including nulls) for a subset of rows in a table segment. A subset of rows is called a granule. Compression enables scanning and filtering operations to process a much smaller amount of data, which optimizes query performance. Oracle Database only decompresses data when it is required for the result set. The compression applied in the IM column store is closely related to Hybrid Columnar Compression. Both technologies process column vectors. The primary difference is that the column vectors for the IM column store are optimized for SIMD vector processing, whereas the column vectors for Hybrid Columnar Compression are optimized for disk storage. When you enable an object for population into the IM column store, you specify the type of compression in the INMEMORY clause: FOR DML, FOR QUERY (LOW or HIGH), FOR CAPACITY (LOW or HIGH), or NONE. All IMCUs for a given segment contain approximately the same number of rows. Oracle Database determines the size of a granule automatically depending on data type, data format, and compression type. A higher compression level results in more rows in the IMCU. A one-to-many mapping exists between an IMCU and a set of database blocks. As illustrated in Example 2-2, each IMCU stores the values for columns for a different set of blocks. The columns in an IMCU are not sorted. Oracle Database populates them in the order that they are read from disk. The number of rows in an IMCU dictates the amount of space an IMCU consumes. If the target number of rows causes an IMCU to grow beyond the amount of contiguous 1 MB extents available in the 1 MB pool, then the IMCU creates additional extents (pieces) to hold the remaining column CUs. An IMCU always allocates space in 1 MB increments. Because the cust_id value is the first value for each row in the data block, the cust_id column is in the first position within the IMCU. 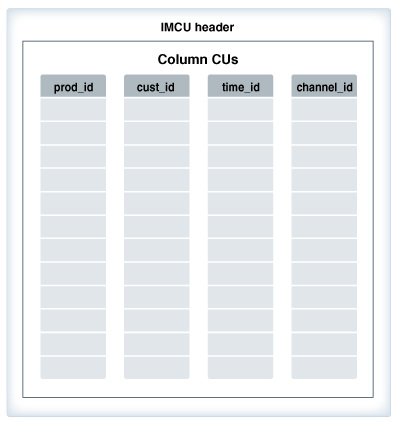 Columns always occupy the same position, so Oracle Database can reconstruct the rows by reading the IMCUs for a segment. A CU is divided into a body and a header. In a CU, the local dictionary has a list of distinct values and their corresponding dictionary codes. The body of every CU stores the column values for the range of rows included in the IMCU. The header contains metadata about the values stored in the CU body, for example, the minimum and maximum value within the CU. It may also contain a local dictionary, which is a sorted list of the distinct values in that column and their corresponding dictionary codes. The following figure shows an IMCU with 4 CUs for the sales table: prod_id, cust_id, time_id, and channel_id. Each CU stores the column values for the range of rows included in the IMCU. Description of "Figure 2-7 CUs in an IMCU"
The database begins by scanning the prod_id column for entries with the value 5. Assume that the database finds 5 in position two in the prod_id column. The database now must find the corresponding cust_id, time_id, and channel_id for this row. Because the CUs store data in rowid order, the database can find the corresponding cust_id, time_id, and channel_id values in position 2 in those columns. Thus, to answer the query, the database must extract the values from position 2 in the cust_id, time_id, and channel_id columns, and then stitch the row back together to return it to the end user. The local dictionary stores the symbol contained in the column. The following figure illustrates how a CU stores a name column in a vehicles table. Description of "Figure 2-8 Local Dictionary"
In the preceding figure, the CU contains only 7 rows. Every distinct value in this CU, such as Cadillac or Audi, is assigned a different dictionary code, such as 2 for Cadillac and 0 for Audi. The CU stores the dictionary code rather than the original value. When the database uses a common dictionary for a join group, the local dictionary contains references to the common dictionary rather than the symbols. For example, rather than storing the values Audi, BWM, and Cadillac for the vehicles.name column, the local dictionary stores dictionary codes such as 101, 220, and 66. The CU header contains the minimum and maximum values for the column. In this example, the minimum value is Audi and the maximum value is Cadillac. The local dictionary stores the list of distinct values: Audi, BMW, and Cadillac. Their corresponding dictionary codes (0, 1, and 2) are implicit. The local dictionary for a CU in each IMCU is independent of the local dictionaries in other IMCUs. If a query filters on Audi automobiles, then the database scans this IMCU for only 0 codes. "How a Join Group Uses a Common Dictionary"
For example, sales is populated in the IM column store. Every IMCU for this table has all columns. The sales.prod_id column is stored in a separate CU within every IMCU. The IMCU header has the minimum and maximum values of each prod_id CU (and every other CU). To eliminate unnecessary scans, the database can perform IMCU pruning based on SQL filter predicates. The database scans only the IMCUs that satisfy the query predicate, as shown in the WHERE prod_id > 14 AND prod_id < 29 example in the following graphic. 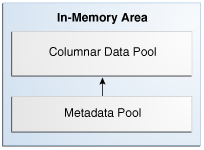 Description of "Figure 2-9 Storage Index for Columnar Data"
The columnar pool of the In-Memory Area stores the actual data: IMCUs and IMEUs. The metadata pool in the In-Memory Area stores the SMUs. Every SMU contains a transaction journal. The database uses the transaction journal to keep the IMCU transactionally consistent. This figure shows IMCUs in the data pool, and SMUs in the metadata pool. Description of "Figure 2-10 IMCUs and SMUs"
The database uses the buffer cache to process DML, just as when the IM column store is not enabled. For example, an UPDATE statement might modify a row in an IMCU. In this case, the database adds the rowid for the modified row to the transaction journal and marks it stale as of the SCN of the DML statement. If a query needs to access the new version of the row, then the database obtains the row from the database buffer cache. Description of "Figure 2-11 Transaction Journal"
The database achieves read consistency by merging the contents of the column, transaction journal, and buffer cache. When the IMCU is refreshed during repopulation, queries can access the up-to-date row directly from the IMCU. The database treats materialized expressions just like other columns in the IMCU. Conceptually, an IMEU is a logical extension of its parent IMCU. Just as an IMCU can contain multiple columns, an IMEU can contain multiple virtual columns. Every IMEU maps to exactly one IMCU, mapping to the same row set. The IMEU contains expression results for the data contained in its associated IMCU. When the IMCU is populated, the associated IMEU is also populated. A typical IM expression involves one or more columns, possibly with constants, and has a one-to-one mapping with the rows in the table. For example, an IMCU for an employees table contains rows 1–1000 for the column weekly_salary. For the rows stored in this IMCU, the IMEU calculates the automatically detected IM expression weekly_salary*52, and the user-defined virtual column quarterly_salary defined as weekly_salary*12. The 3rd row down in the IMCU maps to the 3rd row down in the IMEU. The IMEU is a logical extension of the IMCUs of a particular segment. By default, the IMEU inherits the INMEMORY clause properties, including Oracle Real Application Clusters (Oracle RAC) properties such as DISTRIBUTE and DUPLICATE, from the base segment. You can selectively enable or disable virtual columns for storage in IMEUs. You can also specify compression levels for different columns. 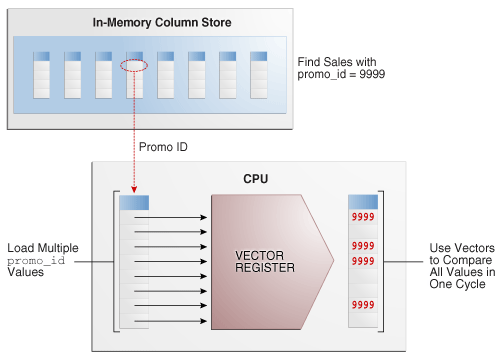 When an IM column store is enabled, the database leverages the ESS for its In-Memory Expressions (IM expressions) feature. However, the ESS is independent of the IM column store. The ESS is a permanent component of the database and cannot be disabled. The database uses the ESS to determine whether an expression is “hot” (frequently accessed), and thus a candidate for an IM expression. During a hard parse of a query, the ESS looks for active expressions in the SELECT list, WHERE clause, GROUP BY clause, and so on. The optimizer assigns each expression a weighted score based on cost and the number of times it was evaluated. The values are approximate rather than exact. More active expressions have higher scores. The ESS maintains an internal list of the most frequently accessed expressions. Control the behavior of IM expressions using the DBMS_INMEMORY_ADMIN package. For example, the IME_CAPTURE_EXPRESSIONS procedure prompts the database to identify and gradually populate the hottest expressions in the database. The IME_POPULATE_EXPRESSIONS procedure forces the database to populate the expressions immediately. ESS information is stored in the data dictionary and exposed in the DBA_EXPRESSION_STATISTICS view. This view shows the metadata that the optimizer has collected in the ESS. IM expressions are exposed as system-generated virtual columns, prefixed by the string SYS_IME, in the DBA_IM_EXPRESSIONS view. The In-Memory Coordinator Process (IMCO) manages many tasks for the IM column store. Its primary task is to initiate background population and repopulation of columnar data. Space Management Worker Processes (Wnnn) populate or repopulate data on behalf of IMCO. Population is a streaming mechanism, converting row data into columnar format, and then compressing it. IMCO automatically initiates population of INMEMORY objects with any priority other than NONE. When objects with priority NONE are accessed, IMCO populates them using Space Management Worker Process (Wnnn) processes. The IMCO background process also initiates threshold-based repopulation of IM column store objects when they meet a staleness threshold. IMCO may instigate trickle repopulation for any IMCU in the IM column store that has stale entries but does not meet the staleness threshold. IMCO determines whether population tasks need to be performed, including whether any stale entries exist in an IMCU. If IMCO finds stale entries, then it triggers a Space Management Worker Process to repopulate these entries in the IMCU. IMCO sleeps for two minutes, and then returns to Step 1. "Optimizing Repopulation of the IM Column Store"
During IMEU creation, parent IMCUs remain available for queries. During repopulation, the Wnnn processes create new versions of the IMCUs based on the existing IMCUs and transactions journals, while temporarily retaining the old versions. This mechanism is called double buffering. The database can quickly move IM expressions in and out of the IM column store. For example, if an IMCU was created without an IMEU, then the database can add an IMEU later without forcing the IMCU to undergo the full repopulation mechanism. The INMEMORY_MAX_POPULATE_SERVERS initialization parameter controls the maximum number of worker processes that can be started for population. The INMEMORY_TRICKLE_REPOPULATE_PERCENT initialization parameter controls the maximum percentage of time that worker processes can perform trickle repopulation. "About Repopulation of the IM Column Store"
The IM column store maximizes the number of column entries that the CPU can load into the vector registers and evaluate. Instead of evaluating each entry in the column one at a time, the database evaluates a set of column values in a single CPU instruction. SIMD vector processing enables the database to scan billions of rows per second. Description of "Figure 2-12 SIMD Vector Processing"
Loads another 8 values into the SIMD register, and then continues in this way until it has evaluated all entries.